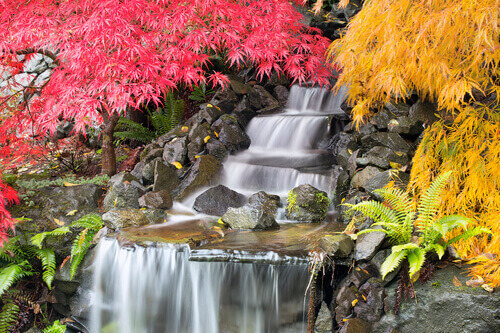 Home > Blog > Water Features > Is Your Waterfall Feature Aerating Your Water Garden Well? Some pond owners feel that their waterfall feature is sufficient aeration for their pond, but is it? As the waterfall churns and moves water by the gallons, it can certainly look like the pond is getting the aeration it needs. In truth, this action does assist with the exchange of gas while infusing oxygen within the water. However, by itself it may not be enough, particularly if you operate the waterfall pump briefly each day. Lots of muck is present: The accumulation of fish waste and decaying matter will increase when water becomes stagnant and when the biological filtration unit isn’t capable of handling it. This muck in turn will result in algae bloom, which creates greater muck. The fish population is too high: One rule to follow when managing fish populations in your pond is that one fish should be present for every square foot of the area’s surface. Once too many fish are present the space will become cramped and aeration will become reduced, which will rapidly reduce their health and vitality. Your fish are oxygen deprived: One telltale sign that your fish are not getting the oxygen they need is if you notice them congregating below the waterfall, as this is where oxygen is the most plentiful. You may also notice them coming up to the surface more frequently than usual, as there isn’t enough in the environment. Algae bloom: Algae, like mosquitos, enjoy still and stagnant water, which is low in both beneficial bacteria and oxygen. If you notice that you’re frequently dealing with algae growth in your pond, this is a clear sign that your waterfall alone is not providing the necessary aeration and water movement. Lots of mosquitos are present: When water becomes stagnant this will often result in a larger presence of mosquitos, which thrive in areas where water is relatively still. This is because these annoying pests enjoy laying their eggs in water that isn’t moving, which means a stagnant water garden or pond creates the perfect habitat for them. If you find that any of the above is true in regards to your water garden or pond, this should be a clear indication that your current waterfall alone is not providing sufficient aeration to keep your pond vibrant and healthy. The importance of moving water and aeration cannot be emphasized enough when it comes to quality pond maintenance, as these are a necessary component of every pond that is ever existed whether manmade or natural. The thing is, many pond owners, understandably, want to spend as little money and time as possible when it comes to pond maintenance, and in their minds, if one waterfall is enough to keep the area aerated, there is no need to spend money or time doing anything else. But In fact, it is recommended to purchase and install an aeration system which can handle 2000 gallons at the bear minimum. These systems run 24/7 and will give the pond the oxygen, movement and good bacteria it needs.